Last week Kymberly, a college roommate of mine, came to visit. We hadn't seen each other in 13 years, so on our first whole day together I brought the boys and Kymberly to the park. 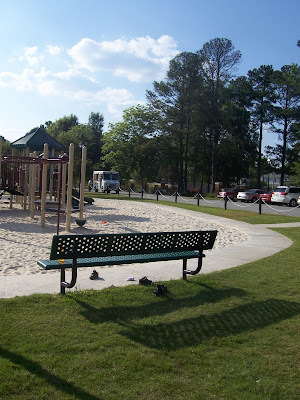 Our town has several nice parks that the boys and I love to frequent. The beauty of taking another adult to the park is the children play (for HOURS) while we sit at the picnic table and "catch up." And this particular afternoon was no exception. 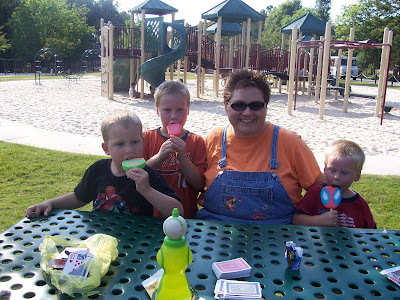 Kymberly and I sat at the picnic table and enjoyed several games of Nertz (fun card game) while the boys covered themselves in copious amounts of fine playground sand. Kymberly generously purchased a cold, tasty treat for each of us. Yummy treats like this don't happen every day... and fabulous friends along for the day don't either!! Maybe you could find another helpful Works for Me Wednesday tip over at Shannon's ! Seriously, Kymberly, the family and I so enjoyed ourselves! I'm so glad you came to visit. Today was Aaron's last day of school. The two younger boys and I ventured over there to enjoy a few last moments of chaos parading as a "class party" before saying, "Good-bye" to Mrs. S. On our way out of the classroom she handed us a few books to enjoy over the next few months. 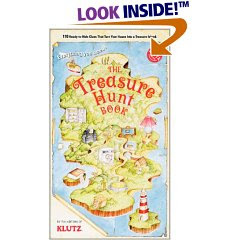 There was an assortment of things, but the one item that we absolutely enjoyed this afternoon is this book of Treasure Hunts from Klutz. After lunch and a little "quiet time" (Scooby Doo DVD and snoozing) the boys begged to play with this book. The book contains all the punch-out clues to do several different treasure hunts. We played two. The second treasure hunt was an act-it-out hunt. I hid the clues and the boys had to act out the clue they found. It was too funny watching Sam trying to be a chair. Or Aaron trying to act out "jacket." This time the treasure was a sheet of Cars stickers stuck in my jacket pocket. I loved watching them work together to find the clues. Their excitement was contagious and watching them encourage each other ("David, you get this clue!") just about made me weak in the knees. Thanks, Mrs. S! Thanks for a great year and for a fun "bag of tricks!" I have loved the boys' teachers this year. (Actually, I've loved them every year, but I have only a few years' worth of experience on the parent side of the parent/teacher relationship. ;) ) I really wanted to send a "little something" just to say, "Thanks for spending a year with my mudpie-maker." With 5 teachers/teacher's aides to buy for, however, my funds were limited. Now, I like to give teacher gifts that are edible. I know some would disagree with me, but, hey, everyone eats. And even if they wouldn't eat what you give them, they know someone who will. *Digressing to tell one of my all-time favorite kindergarten teaching stories. Samantha came to my desk with a gift box tucked behind her back. I unwrapped the package to reveal two rows of spectacular Italian truffles. She was so excited that she said, "Look, Mrs. P. One row for you and one row for Mr. P." I winked at her, smiled a crooked smile, and replied. "Great. Let's eat his row now!!" I bought Crystal Light Lemonade in the 4 pack bottles. (Any brand would work, I just found these bottles the right size for what I wanted.) I bought a set of plastic tumblers that looked "summer-y". And I baked yummy chocolate chip cookies. I made the cutest little gifts each with a bottle of lemonade, a cute tumbler, and several cookies wrapped in a clear cellophane bag. I wrapped them in lime and blue tissue paper and tied them with curling ribbon (blue, teal, and lime) Attached was a blue tag that read, "Sitting in the shade drinking lemonade." Wrap up a box of graham crackers, a bag of marshmallows, and a large chocolate bar with a note that reads, "Have s'more fun this summer!" A jar of tasty chocolate sauce, a couple of inexpensive sundae dishes, and a dollar store ice cream scoop with a note that reads, "Here's the scoop..."
How 'bout fancy pancake mix and real maple syrup wrapped in a large dishtowel? May you enjoy those last few hectic days of school! And three cheers for Mrs. S, Mrs. T, Mrs. A , Mrs. A, and Mrs. S! 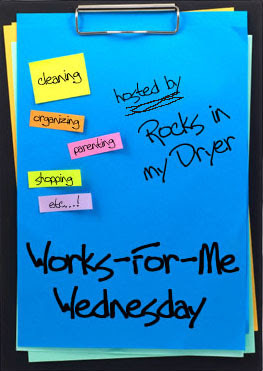 Leave a comment and head on over to Rocks in my Dryer to read more Works for Me Wednesday tips from other bloggers! My head is groggy and my throat hurts. My sinuses are stuffy and my ears itch. So, I spent Mother's Day dozing on the couch while my boys played. Oh, well. Husband promises that the boys will take me to buy flowers and a new fragrance (just what I asked for) as soon as I can smell again. Hmmph. Anyway, I have a special fondness for preschool (or in Aaron's case, 1st grade) crafts, so I thought I would record what the boys made for me. Aaron gave me a huge tissue paper flower with the following note attached, "Dear Mom: Your prity and kind and nothing will sperat us ever." Sam made a cute hand towel for me. His hand print is bright yellow and has a stem and leaves to look like a flower. His fingerprints are all over the card and each fingerprint is part of something... a flower, a bug, a frog, etc. On this Mother's Day I give thanks for the three little boys who call me, "MOM!" 1. I hate tuna fish. Really, really cannot eat it. The odd thing is that sometimes I actually want a tuna fish sandwich, but I can't eat it when I get it. 2. My favorite candy bar is a Reese's cup. I have no particular pattern of eating a Reese's cup, I just make sure to go slow and savor every high calorie nibble. 3. I like my Diet Pepsi and my water from a bottle with a screw on lid. And I really prefer a 12 ounce bottle. Orange juice should be consumed from a small juice glass. And if I am having a drink with a straw I really like the straws at McDonald's. Bigger than average. 4. I don't like gardening. Dirty. Hot. Messy. High-maintenance. 5. My favorite bible verse is Matthew 6:33, But seek first His kingdom and His righteousness, and all these things will be given to you as well. 6. I almost never wear mascara on my lower eyelashes. I ALWAYS have mascara on the upper eyelashes, but my lower lashes are close to my skin and I look rather racoon-ish with mascara on them. I'm tagging Stacy. You can see her blog at http://mylaughlines.blogspot.com/. Is it okay to post a "Works for Me Wednesday" on Thursday? Well, I hope so, because here it goes!! The first thing I thought of when Shannon announced that this week's WFMW would be birthday tips was... gotta share the honeybun cake recipe. At our house, if it is your birthday we start the day with a honeybun cake. It is a yummy, yellow cake with a struesel in the middle (just nuts, no raisins in the struesel) and a powdered sugar glaze on top. I use the recipe from the back of the box of yellow cake mix. My giftwrap tip I learned while watching the Martha Stewart Weddings DVD. Recycle pretty giftwrap by putting it through the shredder. Then use the pretty shreds as filler in bags or boxes. My other giftwrap tip is for packages that will be sent throug the mail. Add wrapped, hard candies to the "filler" (those little "peanuts" or shredded paper) before placing the gift in the box. Festive! Don't forget to post a comment! And look at Shannon's for more birthday tips! My oldest son's class was performing in a school musical. My family (two younger boys on my lap craning to see Aaron and Husband on the wall with the video camera) was watching the crowd of first graders sing songs about colorful rainbows, keeping the planet clean, and how we all need the moon. Now, there was a family behind me also enjoying the show. At one point, the little boy asked his dad if he could use the camera to take a picture of his big brother. The dad, in full instructor mode handed over his camera to the little boy and said, "Now, it's just like using the GUN. You look through here..."